One of the divisive bellwethers of old school gaming is the "race as a class" concept. You can be a human fighter, a human thief, a human wizard, but you can also be a ... "dwarf"? A dwarf what? Can a dwarf not learn thief skills? Not learn magic? Why? What's his occupation? What's his day job? What does he do besides dwarf about? I've had a hard time crystalizing my real feelings about this issue. Sometimes racial classes have felt unnaturally restrictive, or at least inconsistent. Sometimes racial classes have felt like a way to ensure a sense of otherness for demihumans, or seems to be an elegant way to handle monsters as PCs. Race as a class also seems consistent with the source material. In the Lord of the Rings, Frodo's most enduring and relevant feature was his hobbit-ness. I'm not sure what his occupation was. Gentry? Land-owner? I would struggle to put anybody in the Fellowship besides Gandalf into a D&D-like class. Anyway, what if "elf" and "dwarf" were occupations? What if they were titles used for people with a particular skill set? Beyond the fields we know lie the forests of Elfland. The border between these two worlds is mercurial. Like the tides, it sometimes rushes forwards, and sometimes falls back. Creatures that live close to the border are changed by the experience. Deer give birth to silver white fawns. Owls eyes seem to glow with lamplight. Trees grow watchful and whispery. Things become weird. So, too, do mortal men. Humans who live near the borders of Elfland grow as strange as the faerie that make their homes there. They gain an otherworldly appearance--their ears taper to a point, their eyes flash with the colors of beautiful gems, their voices grow melodious as bells. Magic grows inside of them, too. Spells stumble spontaneously out of their lips. Their senses are sharp. Their minds are strange. Elves call themselves "Elfland Rangers." They patrol the border spaces and make sure that the settlements of mortal men are safe from the faerie-touched beasts and marauding fey that might wander over the border. Trolls and redcaps are stayed off by their vigilance. Most folk simply call these rangers "elves" as a convenient term. But do not think that an elf is a true denizen of Elfland. There are things more awful and awesome at the heart of that curious country. "The wealth of Moria was not in gold or jewels, the toys of the Dwarves; nor in iron, their servant.... Its worth was ten times that of gold, and now it is beyond price; for little is left above ground, and even the Orcs dare not delve here for it." A pound of mithryl is worth twice a pound of platinum, but no kingdom mints mithryl coins. It is far too useful to be used in such a manner. Only mithryl arms and armor can hold an enchantment. Only mithryl is free from the touch of iron and, thus, wieldable by sorcerers and their ilk. Only mithryl can be used as ink that can trap spells in grimoires. However, mithryl in its raw form is dangerous. It's mystical aura is radioactive. Silver miners sometimes go mad from the silver fumes. Coal miners suffer debilitating diseases of the lung. Mithryl miners are warped and twisted into ugly, loathsome little men. 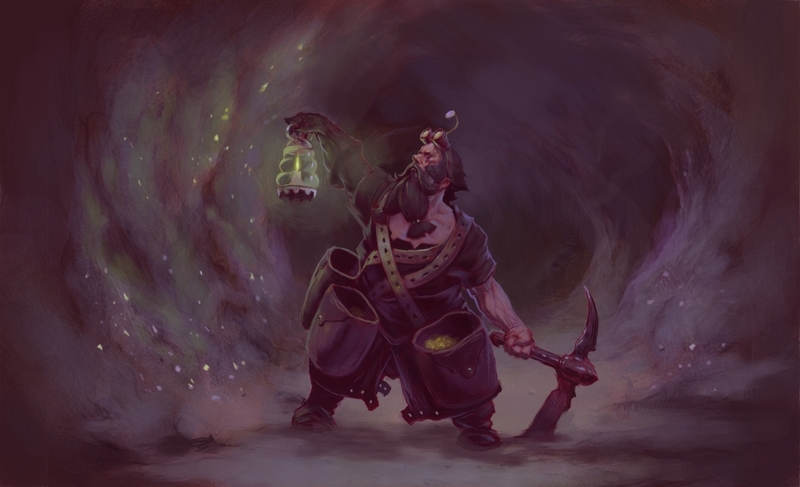 Their backs bent low by their labors, their skin rough and wrinkled, their noses engorged, their ears giant and round, these miners trade their youth and comeliness for the gift of gold. Mithryl mining rights are exclusively controlled by the Stalwart Company of Delvers. This guild has its own idiosyncrasies and incestuous culture. The Delvers spend so long down in the mines, they develop their own slang forms of Common. When not mining, they are notorious drunks and brawlers. However, their mining skills serve them well in many capacities. They're skilled fighters, having often to defend their veins against deep-dwelling monsters. They're cunning in engineering and stonework. Some even claim to be able to "smell" gold. The word "dwarf" is a derogatory term. If one of the Delvers hears such a term used in his presence, you can expect a fight. When you were young, your mother told you that smoking pipeweed would stunt your growth. You did it a couple of times, and it was fun, and you were fine. But then you got your apprenticeship, and you grew up, and you stopped that nonsense. Well, you did, but Patrick from your village didn't. He stayed on the pipeweed. He did stay short. In fact, he looks sort of like a little kid. You heard he joined those crazy hole-dwelling hippies. The Holbytla, or halflings as they're more commonly called, is a agriculture-based mystery cult defined by their ritualized use of pipe-weed. Frequent exposure to pipe-weed has resulted in a mutated, child-like appearance in its membership. The Holbytla don't mind this. They say the pipe-weed teaches them to be gentle and innocent as children. Well, they say a lot of things. Ideally, the Holbytla prefer to isolate themselves from society. They teach agrarian values based on a mythical golden age past, where a stratified farming-based economy actually worked out and was fair and fun. They live close to the land. Really close. In fact, they dig holes into hills and live there. Most of a Holbytla cultist's days are spent farming, but they are noted hedonists. Obviously, ritualized pipe-weed smoking features prominently. Weekly feasting is also a prominent part of their religious practices. Drinking to excess? You betcha. The result is a most curious mix of religious adherents. Knowledgeable in woodcraft and naturalism, but small and constantly high, halfling adventurers are a curious lot. Yeah, I'd probably never use this in a real game, but I think it's sort of an interesting thought experiment. From a folklore perspective, humans transforming into otherworld creatures is entirely precedented. Rationalism and a firm understanding of genetics never really entered into any of the Brother's Grimm stories. Fafnir turned from a dwarf into a dragon via greed. Guests of the Erl-king ride from his halls and discover the world much changed, and they now must ride forever on their hunting horses or crumble to dust. I find the aspects of transformation more compelling than these particular takes.